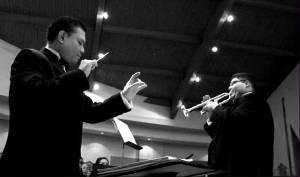 “He is a capable and technically skilled conductor, with a clear and authoritative beat. He is also a good musician with strong musical feelings and convictions. He expresses these with his baton, face, and body, and he can supplement physical communication with specific verbal instructions. [...] I find that he uses rehearsal time efficiently. "I found all of your wind band pieces very beautiful and craftily composed." "[A] few days ago someone give (sic) me scores to your Ave Maria [(Op. 74)]. I must say that now it's my favorite one. Very beautiful. Thank you. It's [a] pleasure to sing this."